Gotcha! If you found this one, it was by sheer luck because the crater is not visible on the surface at all. It is buried under a few thousand feet of limestone. The little added picture you see here is a map of tiny variations in gravity at the surface of the earth caused by rocks of high density below the surface. The redder color indicate denser rock closer to the surface, while the greens and blues show dense rocks at greater depths. It is kind of like a topographic map of the dense rock layer. There are at least two rings of uplifted rock around the crater. This crater was only found a few years ago. 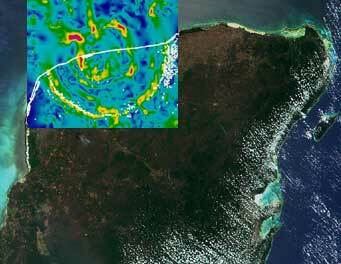 It is called the Chicxulub Crater. Many scientists think this is the one that did in the dinosaurs. It is big enough--over 100 miles across. And it is old enough--65 million years old. But did it really kill the dinosaurs? You might want to do an Internet search for Chicxulub. Overlay of gravity map courtesy of Geologic Survey of Canada.